At the moment, two different men say they are the president of Venezuela. Nicolás Maduro (left) has been in power since 2013. Juan Guaidó (right) says he will be president until new elections can be held. Mr. Maduro, who came to power in 2013, believes he was re-elected as president of Venezuela last May. Most people think the election was unfair and that no one else even had a chance of being elected. Under Mr. Maduro, Venezuela has suffered greatly. Venezuela, which was once rich because of its oil, has become very poor. Venezuela’s money is nearly worthless. There is not enough food or medicine in the country. Over 3 million people have left the country to find better living conditions. Under Mr. Maduro, Venezuela has suffered greatly. Venezuela, which was once rich because of its oil, has become very poor. 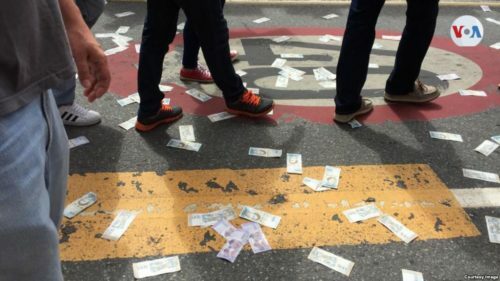 Venezuela’s money is nearly worthless. In the photo, people are ignoring all the dropped bills, since they are worthless. Mr. Maduro has kept tight control on the country. He has worked to change the government so that no one can go against him, putting many people who oppose him in jail. In 2017, there were large protests against Mr. Maduro. Many people were sent to jail and over 100 people died. So far, the army has supported Mr. Maduro. On January 10, Mr. Maduro began his second term as president. The next day, protests began. The National Assembly, which makes Venezuela’s laws, said that by law, Maduro wasn’t really president. Instead, the National Assembly said its leader, Juan Guaidó would act as president. 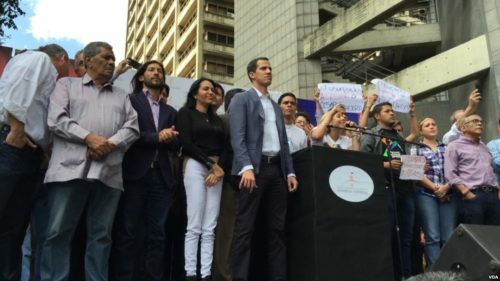 On January 11, Mr. Guaidó (center) began to speak to large groups of people, asking them to come together to remove Maduro. Mr. Guaidó is not well known, but has become popular very quickly by speaking out against Mr. Maduro. On January 11, Mr. Guaidó began to speak to large groups of people, asking them to come together to remove Maduro. Mr. Guaidó, 35, is not very well known in Venezuela, but he has become popular very quickly because he’s willing to speak out against Mr. Maduro. 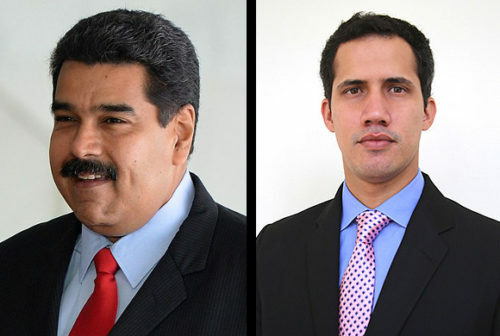 Mr. Guaidó has asked the army to join in getting rid of Mr. Maduro. He says removing Mr. Maduro is the right thing to do because Mr. Maduro didn’t follow the law to get elected. 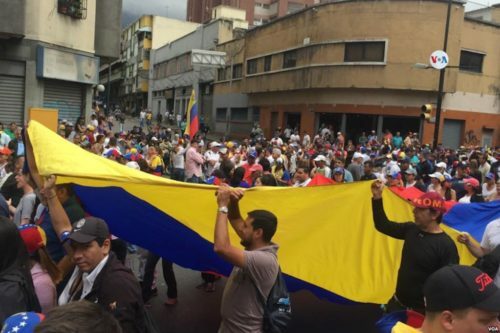 On Wednesday, January 23, hundreds of thousands of people marched in the streets in cities around Venezuela in support of Mr. Guaidó. 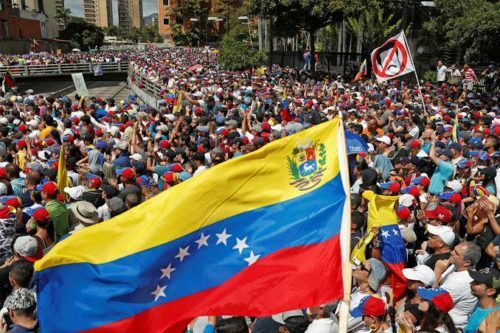 On Wednesday, January 23, hundreds of thousands of people marched in the streets in cities around Venezuela in support of Mr. Guaidó. January 23 is a special day in Venezuela – it marks 61 years since the country got rid of another longtime harsh leader. During Wednesday’s protests, Mr. Guaidó told a crowd that until new elections are held, he was the president of Venezuela. He said he is following Venezuela’s constitution (the rules of the country). The US, Canada, and several other countries have agreed that Mr. Guaidó is the president. But Mr. Maduro has the support of Russia, Cuba, and another group of countries. The next few days will be tense as both sides struggle for control. It will be tricky for Mr. Guaidó to continue unless he gets the support of the army. It will be tricky for Mr. Guaidó to continue unless he gets the support of the army. Because of the changes Mr. Maduro has made in Venezuela’s government, the country’s highest court is full of his supporters. Still, the difficult conditions in Venezuela could encourage soldiers and army leaders to support a new leader. The next few days will be tense as both sides struggle for control. Already dozens of people have been arrested and a few have died. Many people worry that the situation may become more violent.